On Sunday, I drove the family to Corte Madera (about 12 miles north of San Francisco) for the Northern California chapter of Families with Children from China’s (FCC) Between Two New Years Party. The two New Years are January 1st and Chinese New Year. FCC is made up of families who adopted children from mainland China and Taiwan. FCC holds the party every year. There were over 350 people at the party this year. 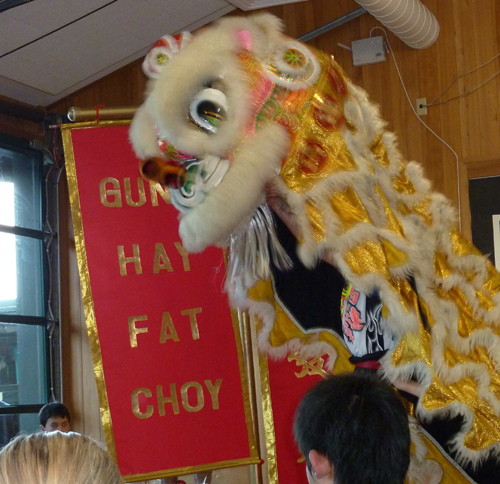 There was a Chinese buffet lunch followed by entertainment that included a Chinese martial arts demonstration, singing, dancing, and a lion dance team. The vice counsel (who gave a speech) and his staff from the Chinese Consulate in San Francisco were also in attendance. There was a classroom for arts and crafts and a room for vendors selling books and clothes. Usually, the annual event is Emily’s and Megan’s opportunity to wear Chinese dresses and buy larger sized Chinese dresses for the upcoming year. But they didn’t feel like dressing up this year. The party was at a private elementary school with multiple playgrounds. Each playground had a play structure so the Emily and Megan were worn out by the time we left. Megan napped during most of the entertainment but was awake in time for the lion dancing.